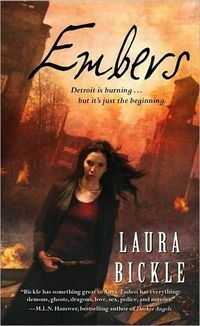 Embers is a story about Anya Kalinczyk, an arson investigator with the Detroit Fire Department, a rare psychic medium known as a lantern (e.g. she basically can “eat” ghosts), who helps out a paranormal investigating team, and has a salamander familiar named Sparky. She and her friends must track down and stop a supernatural arsonist who is setting fires all over Detroit as part of an ancient ritual (which will be completed by Devil’s Night) to summon Sirrush, an ancient and extremely powerful fire elemental, to leave all of Detroit in ashes. This book has it all: action, mystery, romance, tragedy—all wrapped up in an urban fantasy package with a meaningful plot twist. Characterization is deep and powerful. But as hot as Anya is (in more ways than one), I have to admit that Sparky’s little antics stole the show. He’s one of the most independent, headstrong, and entertaining sidekicks I’ve ever read. All-in-all, Embers is a well written tale. Best to read while listening to: anything from Midnight Syndicate, or underground rap, punk, and metal. Not the popular stuff, the underground stuff.